Everyone in your Fantasy Football league will work even harder to be your league champions and bragging rights when they see this incredible trophy . 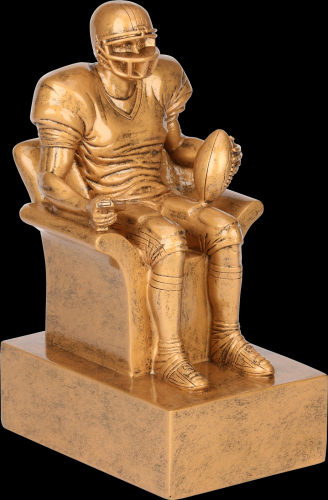 The rich gold colored figure depicts an arm chair quarterback sitting in his favorite chair, football in one hand, remote control in the other and his team helmet and jersey complete the look! This award comes in two different sizes 6" X 3 1/2" X 2 1/2" and 9" X 5 3/4" X 4". The integrated base provides plenty of personalization area for what ever your needs might be. 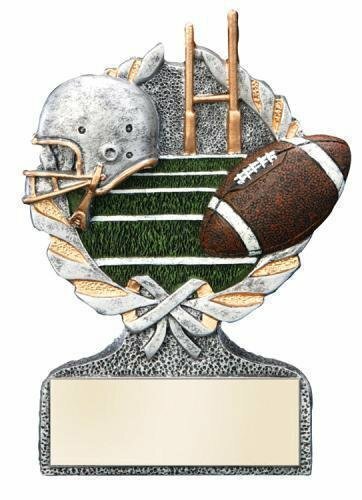 This football multi color sport resins give you a colorful and unique option for your award needs. The award showcases football icons of a helmet, football, goal post, and field. The goal post in a gold, helmet in silver with gold highlights, the brown football detailed with white stitching against a green field including white yardage markings in the background complete the look. A wreath with a bow at the bottom bring the entire award together. Standing 5" tall with plenty of room on the base for your engraving needs is sure to make this a touchdown.